In an uncharacteristic move, James Paul Migliarese left the party early on Sunday, December 23, 2018, after a very short but courageous battle with grade 4 Glioblastoma. While all are saddened by his passing, we know Jimmy wouldn’t want us to be sad but to remember all the happy moments we had with him. Jimmy made many friends during his 59 years with us, and he loved every single one of them. Perhaps you know Jimmy as the middle-middle child of his large Italian family. His parents, the late Ralph and Rose, raised this often loud and always wacky brood across three states: Pennsylvania, Virginia, and North Carolina. 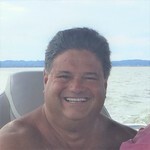 His brothers, the late Ted (Sara), Greg (Kim), and Tim (Kristine), could often be found on the golf course with Jimmy or watching a game of any sport. Or maybe you met him at a New Year’s Eve party or some other party through his sisters, Gina (Dean), Rose Ann (George), Alyssa (Mike), and Katy (Tim). As noted earlier, there were a lot of shenanigans growing up in this tight-knit bunch, who remained by his side until the very end. He was a spirited member of the last graduating class of Andrew Lewis High School in Salem, Virginia, where his last name was butchered by almost every teacher earning him the simple nickname “Mig”. His disarming smile, quick wit, and the ability to talk to everyone charmed both peers and adults. At Virginia Military Institute, he managed to make a Civil Engineering degree at a military college fun. Jimmy made a multi-generational network of friends and brothers because when you start life with three brothers, what’s a few thousand more? The Institute would remain a cornerstone of his life with Brother Rats and dear friendships across the country and world. Whether they called him Jim, Herb, Mig, or Gorvin, they knew they could always call on this loyal friend. In Richmond, Jimmy’s beautiful wife of 32 years, Brenda, and his daughters, Mary and Melissa, had him involved in all sorts of activities. You might have seen him anywhere from tennis matches, piano recitals, or swim meets to sorority weekends and football games at Virginia Tech and University of Virginia. While a vocal and avid sports fan, his love of his daughters made the Tech-UVa games perhaps the only time you’d see him quiet, figuring he’d win either way. When his son-in-law, Braden, joined them, Jimmy brought his party A-game in welcoming the son he’d never had into his family. Unfortunately, Jimmy was only able to put the fear of God into Melissa’s boyfriend, Charles, of 3 years, but that should suffice. Additionally, Jimmy had many nieces and nephews (26 if we’re counting) whom he loved like his own children. Jimmy Mig crossed paths with so many people that it was hard to keep track, but he never met a stranger. Once you were part of his life, he was the friend you could call anytime; no one was more generous or willing to help someone in need. Unless he was watching a Phillies game, then you probably should have checked the score before calling. If you knew Jimmy like we do, you knew the party always followed him. While we will all miss him until we see him again, we will try our best to keep the party going to his standards. A gathering of family and friends will take place at Bliley’s - Staples Mill Chapel, 8510 Staples Mill Road, from 2 to 4 p.m. and 6 to 8 p.m. on Friday, December 28, 2018. A Celebration of Life will be held at St. Michael’s Catholic Church, 4491 Springfield Road, at 11 a.m. on Saturday, December 29, 2018, with a reception to immediately follow. A funeral ceremony will be held at John M. Oakey & Son Funeral Home, 305 Roanoke Boulevard in Salem at 10 a.m. on Monday, December 31, 2018. The family will greet visitors one hour prior to the ceremony. Entombment will follow the chapel service at Sherwood Memorial Park. In lieu of flowers, gifts can be sent to the VMI Foundation, Inc., P.O. Box 932, Lexington, Va. 24450, designated for the Migliarese Family Scholarship Fund. Online condolences may be sent to the family at www.johnmoakey.com.